We’ve seen some quirky homes before, but none quite like this. Today, we’ll visit Haus Trittau with interiors designed by Raphael Sprigmann. He’s known for creating designs with character inspired by his clients. We’ll see how his stripped down approach to design showcases the industrial elements of the home’s build. There’s a definite theme to the quirky look of the home, let’s see if you can spot it! Don’t be fooled by the placid exterior of the home. Once we take a look inside, we’ll find the unexpected. 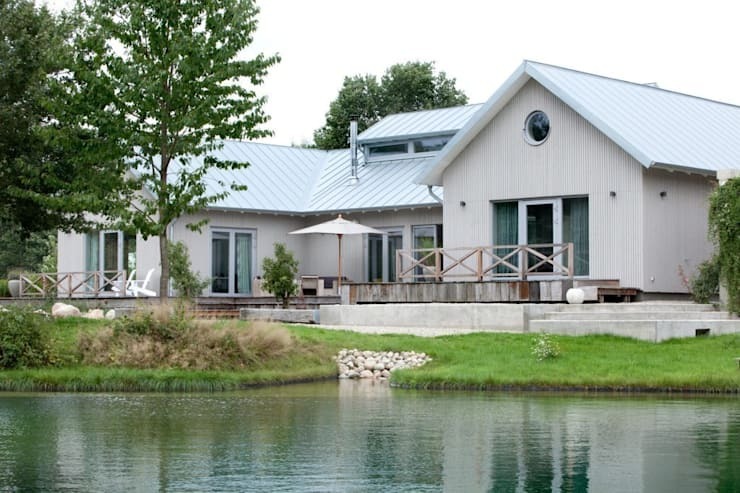 From the exterior, we see a simple home by a lake. 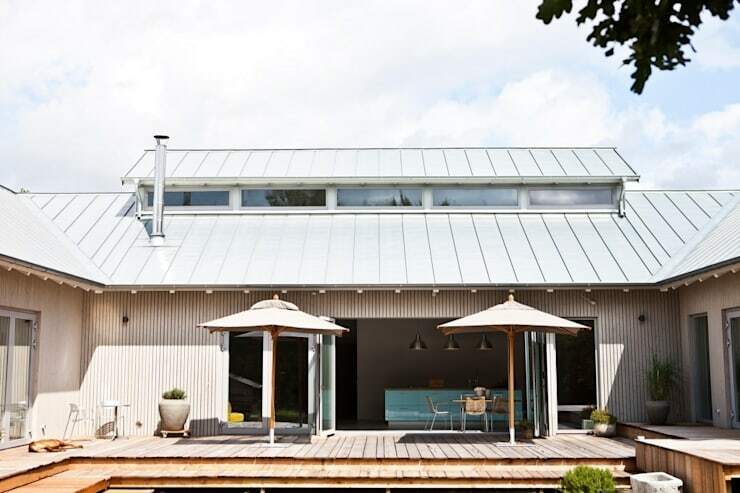 A blue steel corrugated roof lends an industrial flair. That theme will be picked up inside the home, too. There’s nothing too striking about the home from this angle other than its lovely setting. When your home is by a lake or pond, you have beautiful natural landscaping built in! An outdoor terrace at the back of the house lets guests take in the view. Vertical lines dominate the look of the terrace. They elongate the house and terrace, making them feel larger. We love how the patio furniture is grouped together to create a sense of an outdoor living room. This is the perfect spot to enjoy some fresh air and sunshine. Looks like fido agrees! 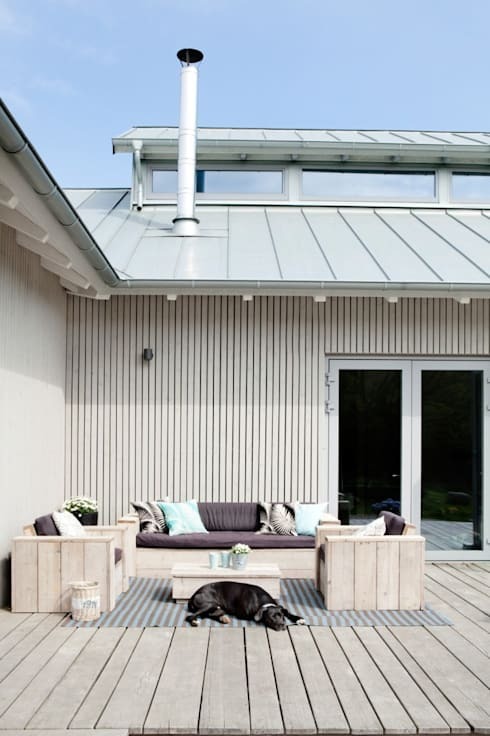 When the owners aren’t taking advantage of the deck space outside, they can open their home to the fresh air outside. Those large windows slide open to erase the divide between the inside and outside. Take a look at the roof and see how the raised portion allows for clerestory windows. This is a great way to bring more light into your home and more visual appeal to the exterior look of your home. Stepping inside the home, we know at once that we are going to see some one-of-a-kind design. 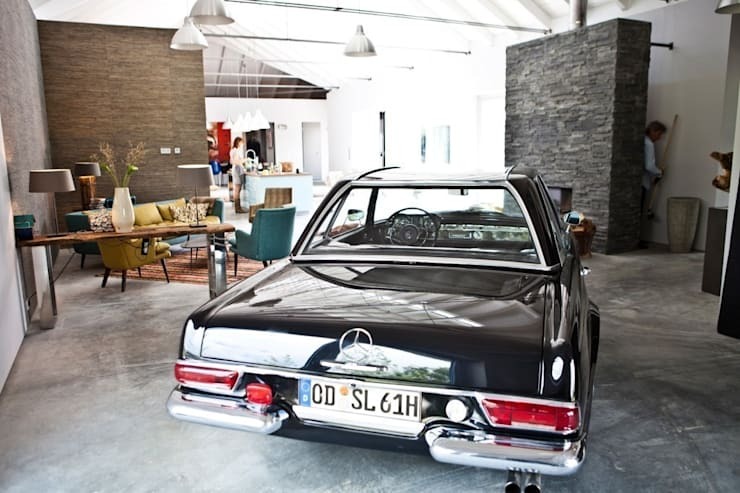 There appears to be a collectors car parked inside the open plan space on the main floor. We never expected to see that! If you look up, you can see the exposed ceiling. Look down, and you’ll see concrete floors. Together, they give us a literal take on industrial style! 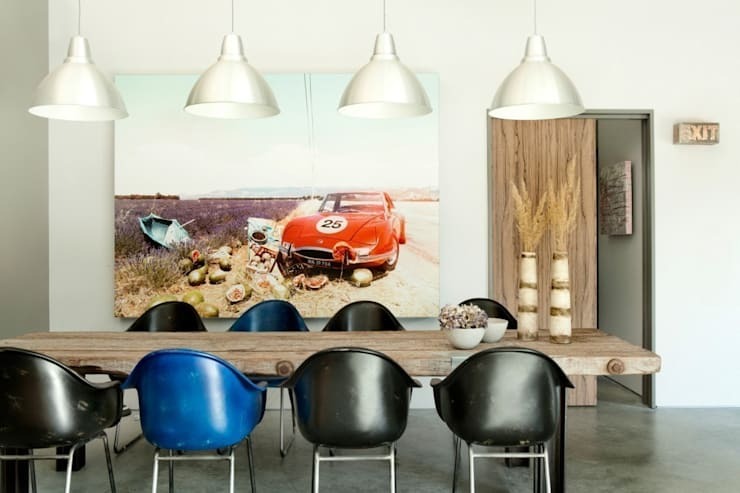 The dining room picks up on the race car motif we saw so literally in the living area. We love how one blue chair among the black ones can make you feel like you’re in the driver's seat. Even the lamps above the dining tables remind us of shining hubcaps. The home continues to delight us with its quirky style. This informal lounge space uses retro style furniture and loud wallpaper to make a statement. It’s a fresh and feminine take on a traditional hunting lodge look. Introducing delicate floral patterns into the design balances the masculine energy in the house. Homify can connect you with interior designers and decorators to get the look you crave. Another corner of the home shows off some cowboy style. 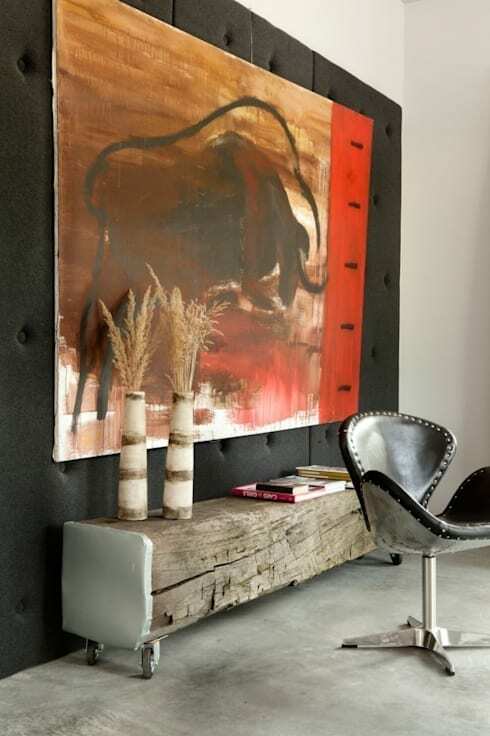 A buffalo painting and a leather stud chair add to the look. We’ve seen some roughly hewn wood before in the dining space. This side table stands out in our minds for its combination of rustic and industrial style. Notice the textured black wall in the background. It brings more depth and boldness to the room. Let’s end our tour by checking out the fireplace in this quirky home. A tall dry stack chimney with rough logs tucked behind it sits between the kitchen and living spaces. 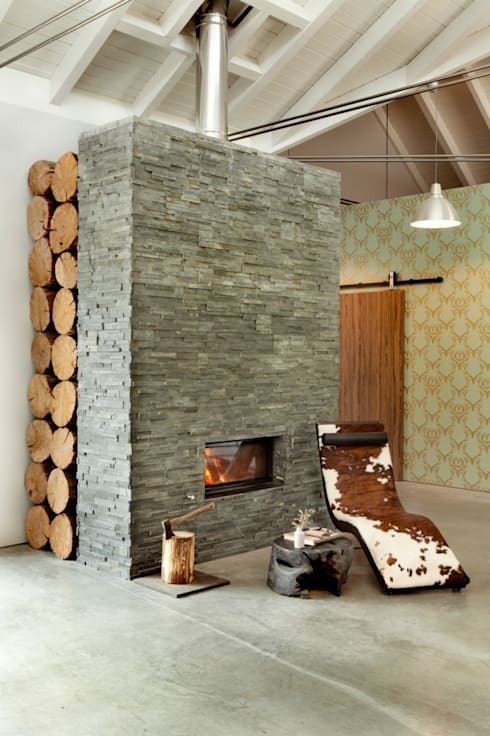 The rustic elements from the wood and cowhide lounge chair stand out in the industrial space. We hope you enjoyed our tour! Visiting a home like this opens up our minds to the possibilities of home design. Want more quirky home inspiration? Check out our feature on a classic brick house with gallery-inspired interiors. 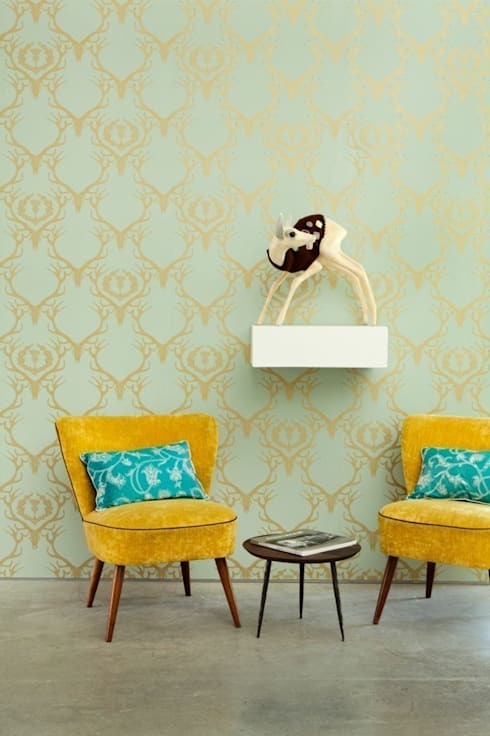 How do you bring more individuality to your home?